Training BJJ in the Gi is truly a unique experience. It is not that much the fact that you’re wearing the Gi, but the feel of the material and the manner in which it is used. InN terms of feel, the first time you wear a BJJ Gi is not something most people associate with comfort. A Jiu-Jitsu Gi consists of an extremely sturdy and hard jacket, and thick, multilayered pants. The way Gi’s are woven is also highly specific. This is all very understandable, given the amount of “abuse” a Gi needs to be able to take. However, it doesn’t change the fact that training in a durable Gi is like trying to roll with a heavy blanket on. There is, however a hack – lightweight Gis. Today, we’ll take a look at the best Lightweight BJJ Gi options that can replace all your other kimonos. 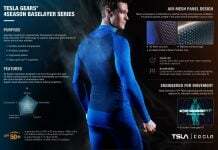 Thinking a lightweight BJJ Gi is not going to be able to withstand the demands of training? think again. When we’re talking about a lightweight Gi, we mean a modern design, state-of-the-art one, not an Aikido Gi. More on that later. For now, it is enough to understand that you can both feel light and comfortable, and train BJJ with a Gi that’ll last. yeah, I didn’t believe it either until a short while ago. Completely by chance, I acquired an ultralightweight Gi (featured later in our best lightweight BJJ Gi guide) and it changed my grappling life. Suddenly, I could train and roll wearing something that resembles a rashguard more than it does a kimono. And yet, it is proving to be just as tough and durable as the stiff and uncomfortable ones. When it comes to the best lightweight BJJ Gi, the list is not as short as you might think. 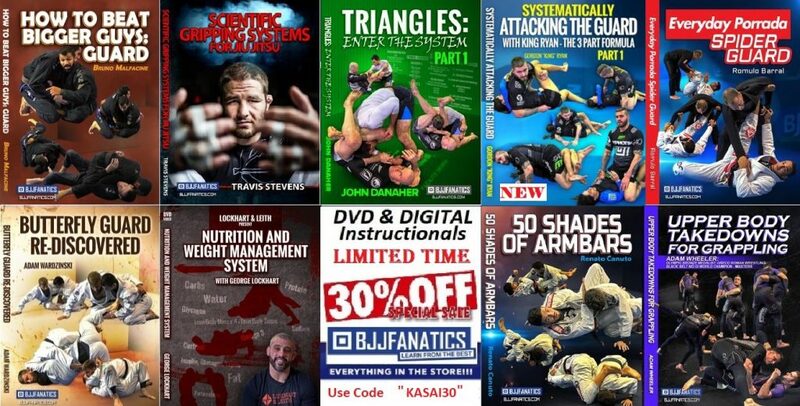 Basically, every larger BJJ Gi manufacturer out there has at least one lightweight series available. Completely understandable too, given how different training in one is. Lightweight Gis are actually the latest product of an ever-growing industry. The real challenge with a BJJ gi is durability. Given the price of kimonos, it’s understandable that people like to buy stuff that lasts, preferably for years to come. On that note, the logical thing is to go for the tough, sturdy, Gi that weighs a ton and is hard to move in. 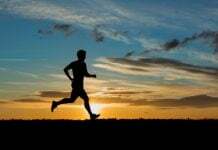 Plus, you need to factor it in whenever you weigh in for competition. If you cut weight to grapple, then you know how much of a hassle that is. And this is all before we talk about training in hot weather. The need for a lightweight Gi that has all the same properties of a heavy-duty one, but none of the drawbacks was just a question of time. Luckily, manufacturers responded to the need for such a kimono. The weave used in a lightweight Gi is usually a pearl one. 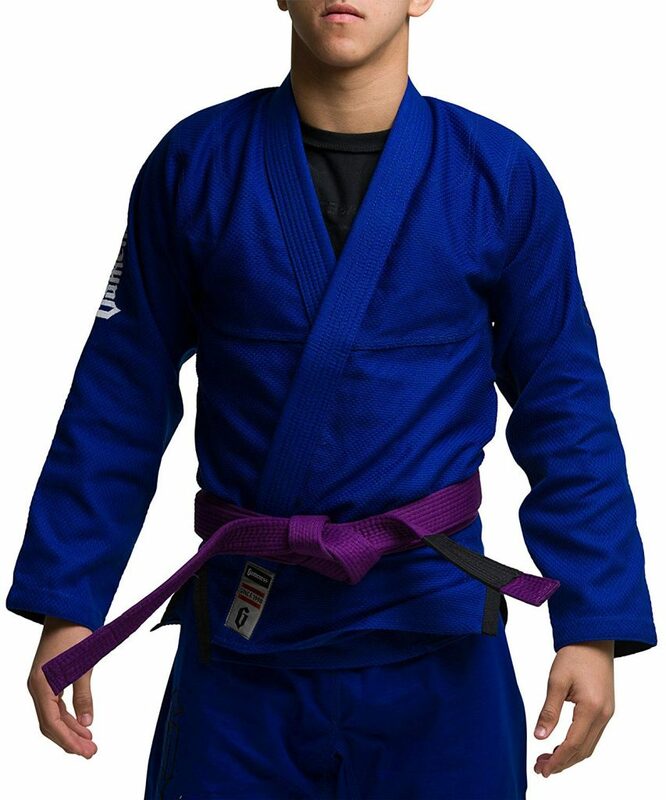 It is the lightest Gi weave that’s allowed for use in IBJJF tournaments. To be fair, there is also single weave ultra light Gis, but they do not last nearly as much as others. The pearl weave allows air to pass through and does not impede range of motion while offering amazing tensile strength. Finally, there is the Hybrid weave Gis, meaning combinations of weaves that deliver the best possible Gi both in terms of performance and weight. In reality, everyone needs at least one lightweight Gi. 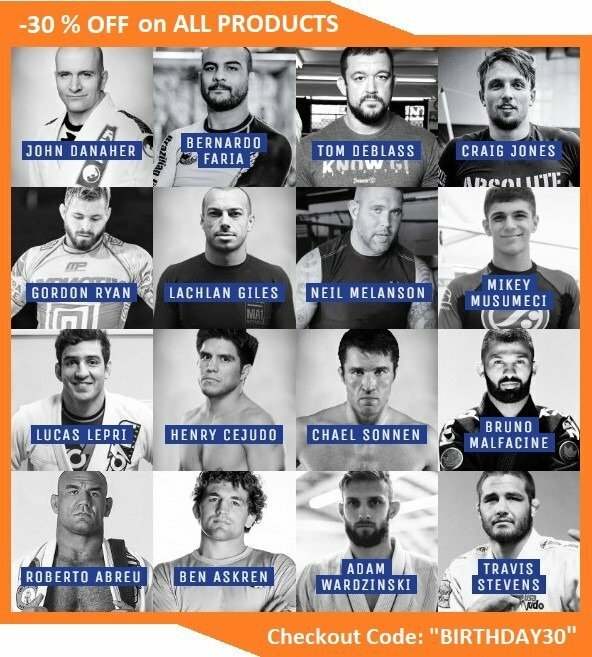 Even if it’s just for competition, it is going to change the way you approach Jiu-Jitsu. Plus, the price of lightweight Gis is far more affordable than that of double-weave heavy-duty ones. 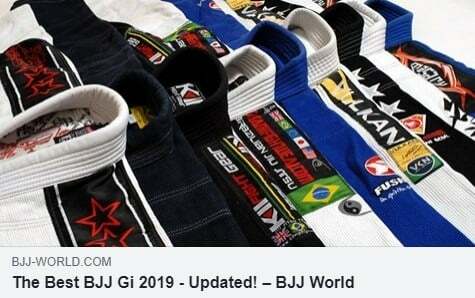 In order to facilitate next Gi shopping spree, we compiled a list of the best lightweight BJJ Gi options that are readily available in 2019. They’re becoming increasingly more popular though, so you’ll need to get a move on if you’re going to get yours. 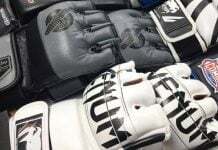 As far as BJJ gis go, Fuji is one of the oldest brands out there. They are firmly established as a brand that delivers some of the best competition Gis of all times. In 2019 they still hold their weight, albeit this time via their lightweight Fuji Summerweight Gi. Overall, this is one of the best BJJ Gis, period, and certainly a top contender among lightweight kimonos. This Gi is, first and foremost, completely IBJJF legal. It is available in the three basic colors: black, blue and white. it also comes in all the usual adult sizes, ranging from A1 to A6. It is the perfect fit for both male and female grapplers. The weave is pearl and the material is 100% cotton. The collar contains lightweight rubber that helps keep the lapels dry. The Fuji Summerweight is one of the lightest Gis ever produced. It comes preshrunk and in the standard Fuji-specific cut. It is highly durable, extremely comfortable and unbelievably well priced. Comes with two free Fuji patches. Pretty much on the same level as Fuji, Hayabusa is a brand that’s very familiar to grapplers. It is not a BJJ specific brand, as it produces MMA gear as well, but the quality of products is unquestionable. Their Gis area also high-level, as proven by multiple world champions who choose to compete in them. Certainly a top best Lightweight BJJ Gi contender for 2019. The one thing that sets the Hayabusa Pearl Weave Light Gi aside from others is the versatility in terms of color. While the basic blue, white and black colors are IBJJF legal, all the other options, like maroon, grey and stone white are not. That doesn’t mean that you can’t train in any and all of them, though. Sizes include all options between A0 and A5. As the name suggests, it is a pearl weave Gi, constructed from 420 gsm PEARL weave cotton. it features reinforcements in key stress areas like lapels while staying ultralight. The pants are also very lightweight, weighing in at only 8 oz and featuring ripstop cotton. Made for optimal performance. Sanabul is fast becoming a brand that’s rising to the occasion. If they keep up delivering such quality products, they might even surpass some of the “giant” BJJ Gi brands. They offer not jsut quality Gis, but different designs as well, both at an astonishingly low price. The perfect Gi to have in your collection, especially as a lightweight option. In terms of color, “illegal” grey leads the way, with the regular legal colors following suit. 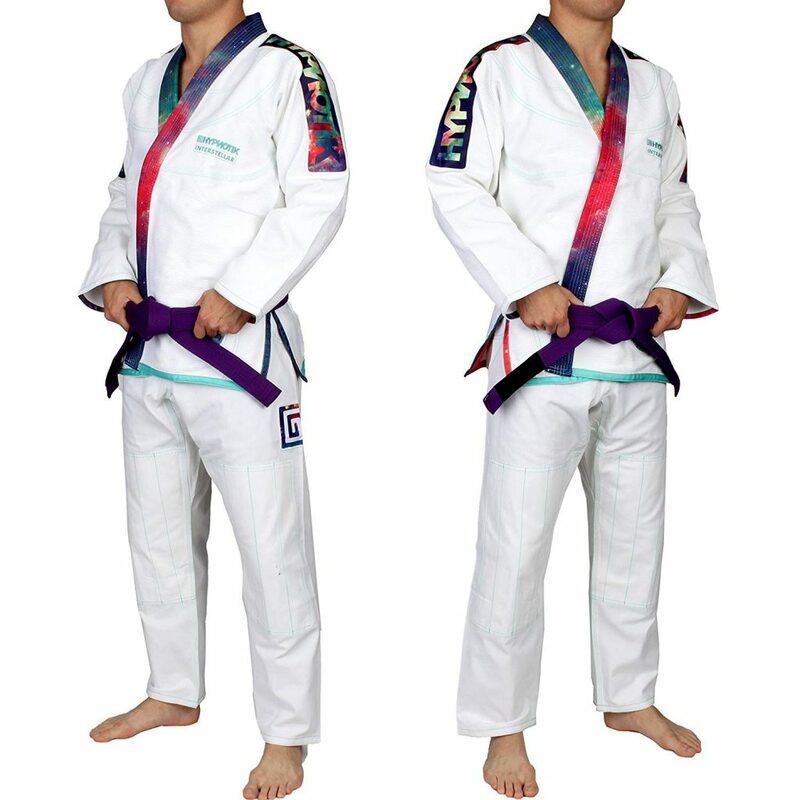 Actaully, there are two versions of the blue Gi, one standard and one navy, both of which are IBJJF legal. Sizes include A0 to A4 but are unique to the Sanabul athletic cut. Make sure you look at the size chart before choosing the one for you! The Essentials V2 Lightweight Gi comes completely pre-shrunk, This Gi single weave, meaning it is as light as a BJJ gi can be. Despite this, this Gi has proven to be surprisingly durable. It also has special features like stiffer rubberized collars and dens-knit embroidery. Comes with a free belt. Although you might be surprised to see this Gi in our best Lightweight BJJ Gi guide for 2019 it more than deserves its spot. Although the brand might not be a household one (yet) it definitely delivers one hell of a product. The Air BJJ Flow Gi is an ultra lightweight Gi that comes in a 100 % pre-shrunk version. Actually, the guarantee is that it won’t shrink more than 1 % no matter what you do to it. 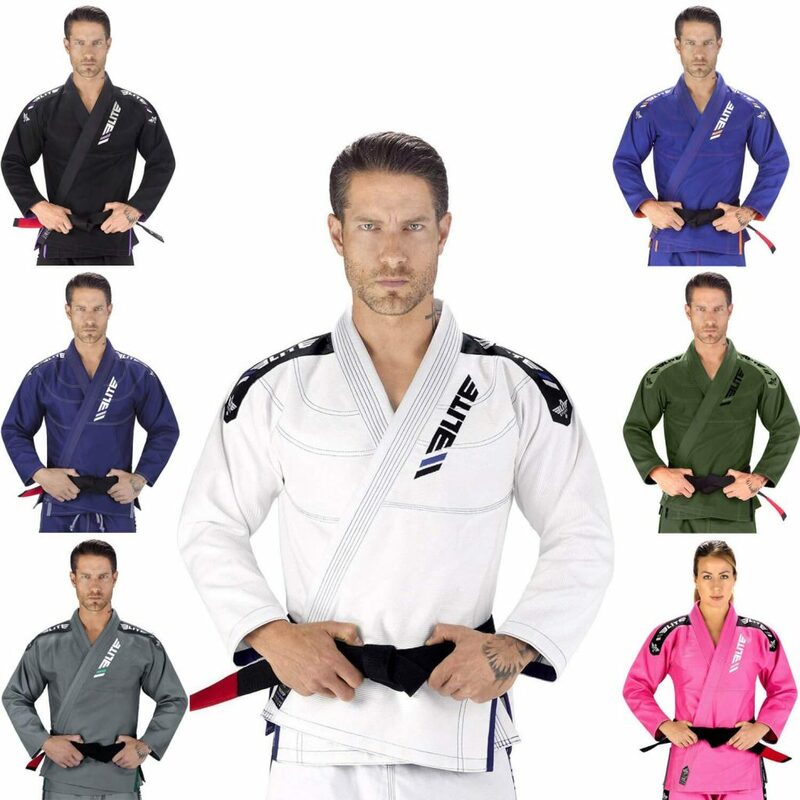 Size-wise, this Gi offers a lot of variety, available in 9 different sizes, from A1 to A4. It comes in a lot of in-between size options, like A1L or A2H. Consult the size chart for more detailed information. The material is 100 % combined cotton in a pearl weave pattern. Completely legal for competition, and available in white, blue and black. An innovative high-density foam drawstring ensures that you won’t have to fiddle with it constantly. We arrive now at teh Gi that had me switch my kimono persuasion. I was always after the sturdier kimonos, those that are hard to handle and make opponents uncomfortable. Imagine how I felt when I discovered I can do the same with a much lighter and more comfortable Gi. The Ultra Light Elite Sports Gi got me exactly that. As versatile as Gis can get, none offer as much as the Elite Ultra Light. While it is IBJJF legal, as its name suggests, it does come in versions that are not allowed at tournaments. The colors on offer, despite the regular three, are grey, navy, and pink. A1 to A5 sizes are available for each color variant. Extremely cool design and a great fit for both male and female grapplers. 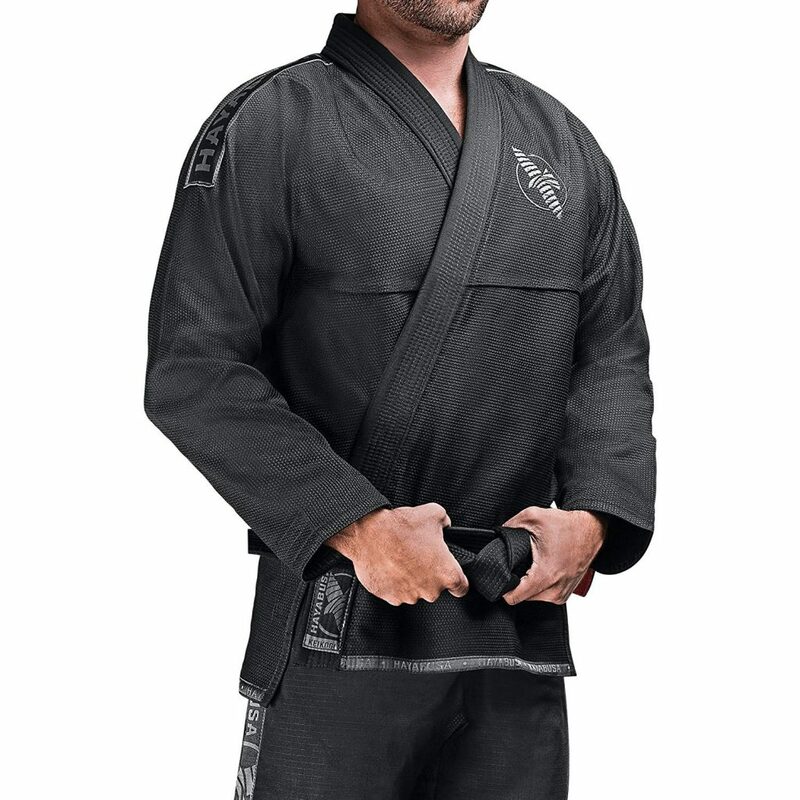 This Gi feels as light as a rashguard when you’re wearing it. It features anti-odor and antimicrobial properties and doesn’t allow a buildup of sweat. Virtually indestructible and 100% pre-shrunk. Comes with a free BJJ belt. Gameness is another one of the big name players in the BJJ Gi business. In fact, they have one of the best Lightweight BJJ Gi options in existence – the Air Lightweight Gi. Far from their only product, this Gi delivers on everything you’d want form a lightweight kimono. Color options are limited to the three IBJJF legal colors of white, black and blue. On the other hand, sizes are more versatile, ranging from A0 to A6. 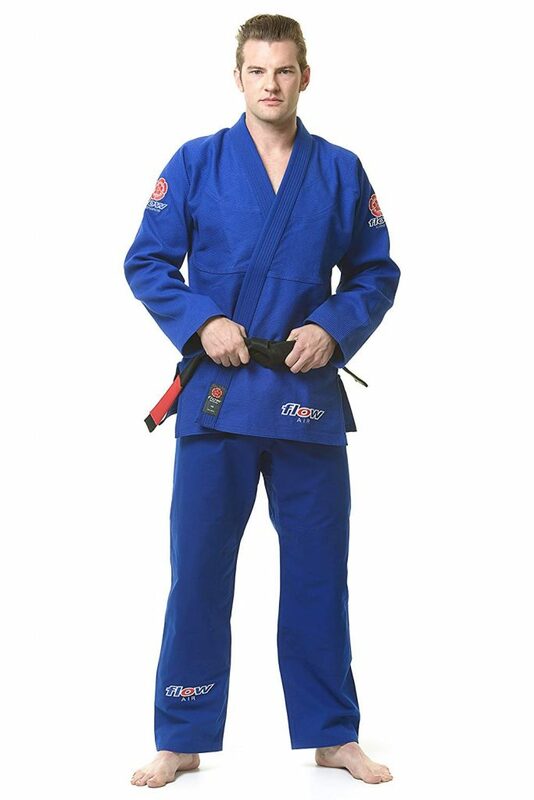 This Gi is the perfect fit for any occasion, whether you want to compete or just train in it. Gameness is well known for high-quality pearl weaves, so it is no wonder that this one has the same 350-gram pattern. Pants weight in at only 8 oz while featuring full ripstop properties. In terms of BJJ Gis, this one is among the more famous options out there. Simple design and awesome durability ensure you’ll be able to wear this one for a long time. Comes at a really great value for the price! 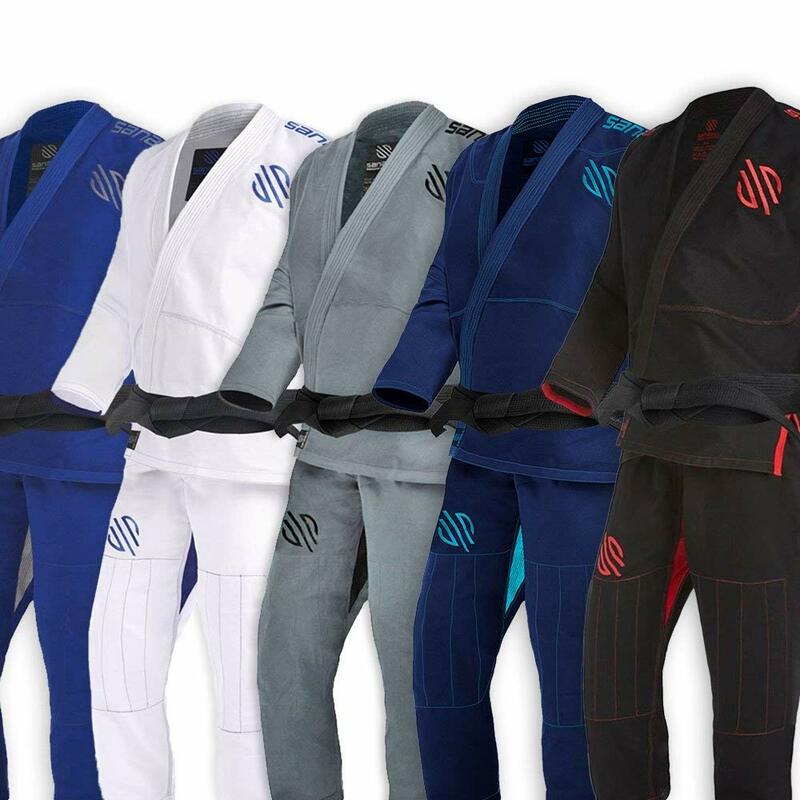 Tatami is one of the best brands out there that offer Jiu-Jitsu specific Gis. Their line of kimonos has always been impressive and never seizes to deliver new products. Tatami’s answer to the demand for lightweight Gis is the Zero G V4 Gi, a new twist on a BJJ classic. This BJJ Gi is full of innovative concepts and designs, making it a revolutionary grappling product! The material is reinforced pearl weave, offering both durability and extreme comfort. There’s absolutely no restriction to movement, and the Gi is perfect to train in even when extremely hot. 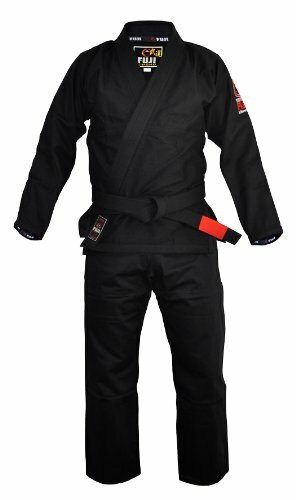 There’s is unique contrast stitching that gives this awesome Gi even more style and flair. The complete Gi, pants, and jacket included, weighs in at barely 1.5 kg, (3.3 lbs) which is pretty much the lightest a solid Gi can get. Collars area rubberized to prevent absorption of moisture. The jacket is made from a single piece of material, making it notoriously hard to tear. Pants feature panels with diagonal stitching. Comes in black and white, and in all usual sizes (A0-A5). Nearing the end of our comprehensive best Lightweight BJJ Gi guide for 2019, we have to include a somewhat controversial option. For those that like the traditional Gi style, there are plenty of lightweight options above. For those that like to introduce a bit of individuality to their training, the Hypnoitik Interstellar Gi is the perfect way to do so. This Gi comes in a white color and is a limited edition Gi. Despite being white, this Gi is not legal under IBJJF/UAEJJF rules. The reason for this is that both collars have a different color than the rest of the jacket, which is illegal under certain rulesets. In fact, the collar features a multicolored design with bright colors depicting space. The jacket is 100% cotton, pearl weave and pants are 11 oz twill cotton pants. The interstellar graphics are fully sublimated and will last as long as the GI. Apart from an undeniably unique design, this Gi also comes 3 times pre-shrunk, so you can rest assured it’ll never change length. All the usual sizes are available until stock runs out. Arrives in a custom, interstellar themed drawstring Gi bag. The reason we’re looking for the best Lightweight BJJ Gi is that nobody likes to train grappling in an armor. However, apart from comfort, there are a few other considerations when sometimes to lightweight kimonos. They don’t just help us get through training easier, but also help us “cheat” the system a bit. 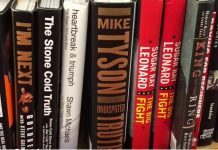 Namely, in competition terms, a lightweight Gi will allow you to have a much more relaxed weight cut if you need one at all. In comparison, regular Gis are twice as heavy. While not cheating per se, they do help you turn tournaments into more enjoyable experiences. Plus, competing in them is a lot more comfortable. From a technical standpoint, lightweight Gis are much easier to manipulate. This means you can use lapels, collars, sleeves etc to attack your opponent. You’ll be able to access your favorite Gi weapons much more easily than with regular Gis. Plus, people won’t be able to control you as much, because lightweight Gi’s are harder to manipulate with grips. There’s also movement restrictions, which are non-existent with lightweight Gis. it is basically like rolling/competing No-Gi, but with all the benefits of Gi Jiu-Jitsu. On a final note, there’s climate. Lightweight Gis are not just the best, but the only option for people living in warm spots. Training with a full-on Gi in 95+ degree weather is neither fun nor reasonable. Lightweight Gis not only alleviates some of the discomforts but also provide much better ventilation than heavier Gis. 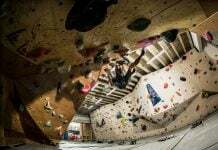 Next articleEveryday Porrada, Nutella BJJ – What Does It All Mean?